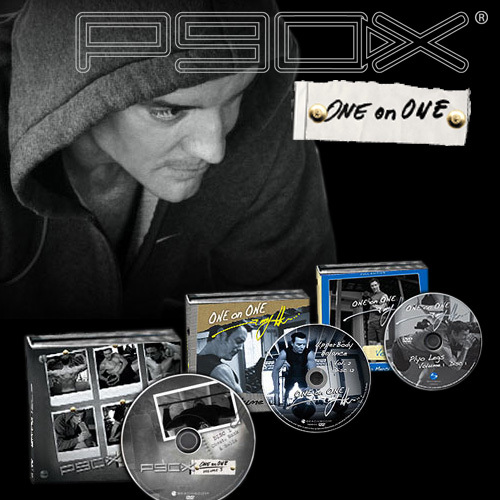 P90X One on One – Volume 2, is the second season and contains 12 DVDs with 12 new workouts designed to keep your muscles confused by always changing things up. Sweat like never before. Tony does it again! When you are done with this cardio workout, you will be calling for your mommy. Extreme core workouts using various types of balls. Snack on this! Tony takes you back to basics, old school style, like 2,000 years back. In only 30 minutes, you’ll increase your flexibility in ways you never thought possible. Even wildlife was trying to get a ticket to this ONE on ONE! Tony’s still proving that having no time is no excuse for skipping your workout. This combo platter has 3 slammin’, back-to-back 10-minute workouts. Tony helps you fire your glutes and shred your abs in the most creative ways. Seriously, where else can you get an intense workout while playing a game of cards? This 30 minute workout wonder chisels your large back and core muscles. Just 30 seconds per move and nothing fast, but you’ll feel it. And your trunk will thank you. An entire workout on only one leg! Just when you thought you had seen it all from the Master of Muscle Confusion, he comes at you hard with a little twist. Isometric exercises are thousands of years old, with examples from yoga poses to Chinese martial arts. Now Tony gives you a completely isometric routine just to shred the fat off your abs and chisel definition! Tony applies the proven principle of Muscle Confusion to cardio training. This routine will leave you guessing, gasping, and competing in a calorie-burning contest with Tony “ONE on ONE”. Tony’s circuit of 100 jump rope sets, 30 ultra sculpting crunches, and 20 strength crazy push ups will quickly rip you up. Also, take Mason’s challenge at the end. Can you beat Tony “ONE on ONE”? ONE on ONE on one leg 4 legs! Tony works the biggest muscles in your body while forcing you to work on one leg! The benefits of this routine will be immediately apparent as you build strength, stamina, and balance! Every move is a battle! Forget your preconceived notions of an upper body workout! You need “every fiber” of your upper body engaged…all the way down to your quads! What is P90X One on One? The One on One workout program was developed by Tony Horton after the success of the original P90X home workout DVD program, to be used as continuation workouts for those who have completed and graduated from the original P90X program. Volume 2 is the second season and contains 12 DVDs with 12 new workouts designed to keep your muscles confused by always changing things up. Using Tony’s original “muscle confusion” foundation that made the original P90X program so popular, Tony introduces new workouts in which your muscles are forced to adapt to new moves all the time, so they keep growing. Are You A P90X Grad? The volume 2 collection gives you a year’s worth of killer routines you’ve never done before. These are crazy intense P90X style workouts Tony’s devised to push himself. They’re all no frills and unscripted, just you and the “man” working out in his private gym. And each is only 20 to 40 minutes long, making it easy to work them into your schedule. Get the entire second season (Volume 2) in an exclusive DVD collector’s box. The Volume 2 Full Edition comes with 12 heart pounding exercises. All packaged in a sturdy sleeve, so it will last you for years to come.